Marketing is designed to aid the conversion of leads into opportunities by creating the appropriate activities to manage processes for a marketing campaign such as the mailing of a letter or the making of an outbound sales call to the lead. Marketing also applies to customer retention and cross-selling campaigns focussing on existing customers or prospects. Marketing Lists are an important organisational feature of CRM which can be applied to many different business processes. These lists are a collection of leads, accounts or contacts that can be created manually or in accordance with any possible filter criteria. Marketing lists can be used to quickly create activities with a quick campaign and run a mail merge to Word. Marketing lists are also used to drive a full marketing campaign. A series of campaign activities can be defined for a campaign to act as templates for generating activities against a collection of mailing lists. 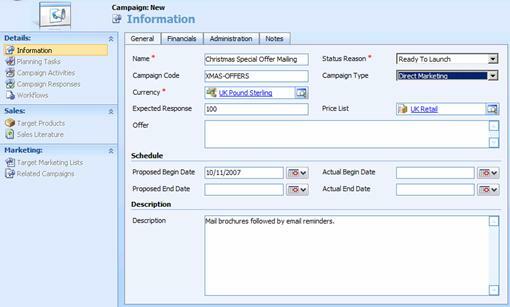 In our example, two campaign activities are created to act as a template for a mailshot and a follow-up call activity. A campaign activity is created as a template for each of the required activities and distributed as activity records created against the members of the appropriate marketing list. Associated costs can be summated for each campaign by looking at the costs associated with each distributed activity. The performance and return on investment can be measured by creating campaign responses for each campaign and tracking them against any opportunities created. Marketing Lists can be used to generate successive campaigns or control business processes such as regular mailings or courtesy calls made to customers. Marketing lists are defined for leads, accounts or contacts and consist of little information other than the list of members. Members can be managed from the marketing list form by selecting the Manage List Members form and clicking on the Manage Members button, which provides several options to manage members by using the features of advanced find. Note: Remember that a filter can be complex and include related entities so that customers (accounts or contacts) can be filtered in accordance with, for example, the products in which they have shown an interest. The lookup members option allows you to define a selection with an advanced find query and add the selected accounts, contacts, or leads into the marketing list. 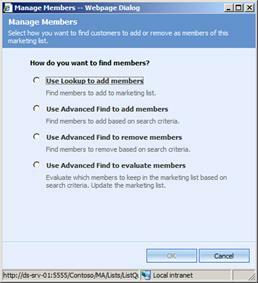 Add members will add new members found via the required query into the marketing list and remove members will remove members from an existing list in accordance with the query. Evaluate keeps only those members already on the marketing list that match the query and discards the remainder. Marketing Lists can also be useful in situations where the advanced find query is not appropriate for selecting the required data. In this case, a marketing list can be created by manually adding the entity occurrences to the list. The contact, account and lead forms allow individual records to be added or removed from marketing lists with the add to marketing list button so a salesperson can create their own marketing lists. Marketing Lists can also be created automatically when performing a bulk import from a spreadsheet file to create, for example, a marketing list for a tradeshow. 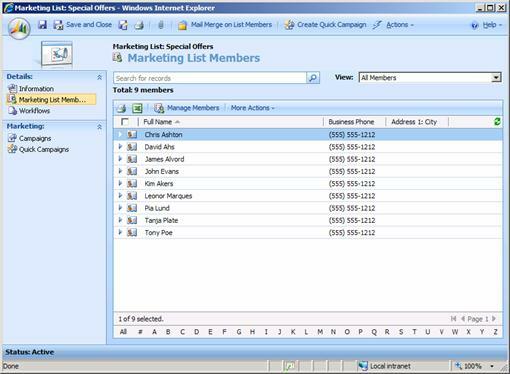 Mail merging to Word is available from the toolbar of a marketing list and creates a mail merge file integrated with Word for creating letters, envelopes, faxes, labels and also emails directly from Outlook (see the Using CRM section). 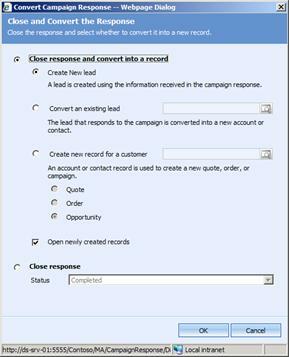 Quick Campaigns (see the Using CRM section) can quickly generate activities for a marketing list but campaign activities (see below) offer a more sophisticated approach. Campaigns are used to help plan and organise marketing campaigns and keep track of costs and return on investment. A campaign is created from the marketing-campaigns work area and specifies basic campaign details, including the price list, the proposed and actual start and end dates and a budget and estimated revenue (on the financials page). The Expected Response refers to the percentage of campaign responses expected from the activities performed. The Target Products and Sales Literature panes are for reference only and provide users with quick access to relevant information when dealing with a campaign response. Related Campaigns may also be of interest to the Marketing department (perhaps for reporting purposes). The planning tasks pane is a quick method of adding tasks to the current campaign to represent the planning and preparation process. These tasks do not affect the campaign in any way and are just a convenient place to view the various tasks associated with a campaign. Campaign Activities are templates used to generate activities related to a campaign against the members of the marketing lists associated with the campaign. A new campaign activity is defined and a channel selected to indicate the type of marketing activity (letter, fax, email and so forth). The activities are then distributed and recorded as activities within CRM. Later these activities are converted to campaign responses so that the success of the campaign can be monitored. Each activity generated can have an associated budget and cost which are summated on the campaign activity form and could also be used to help manage outsourced vendors (external suppliers). · Letter via Mail Merge which uses the Outlook CRM client. · Fax by Mail Merge which uses the Outlook CRM client. 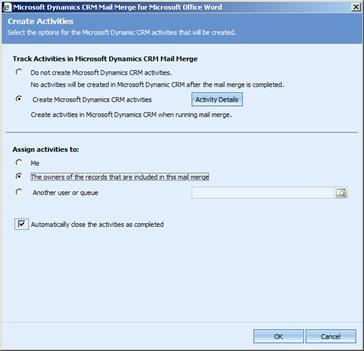 · Email via Mail Merge which uses the Outlook CRM client. The Distribute Campaign Activities button appears once the campaign activities form has been saved and brings up a form template to create the appropriate activity record for each entity occurrence in the campaign marketing lists. You can control the ownership of the created activities. Note: The Anti-Spam Setting excludes records that have been contacted within the specified number of days. Note: It does not seem possible to attach the relevant document to the activity so perhaps you could refer to it in the description for the activity or the campaign activity. Note: You could create two campaign activities if Outlook is not available. You can save time by defining a campaign template if you are running a series of similar campaigns. An existing campaign can be copied to a template or copied as a new campaign from the action menu when looking at the campaign form. Campaign Responses are used to monitor the activity resulting from a campaign. Activities created with a campaign have a Promote to Response option on the actions menu (this should really be more prominent). Selecting this brings up the campaign response form, which can be used to record additional details required by the marketing department and also drives the reporting to measure the success of the campaign. 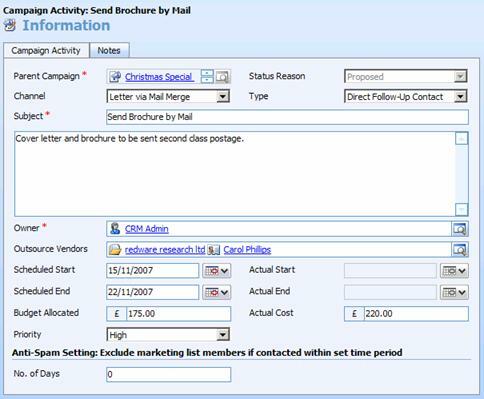 Individual activities created for a campaign activity can be viewed in the navigation pane of the campaign form and promoted to a response as required. Campaign activities can also be viewed in the workplace-activities area as well as against the corresponding lead, account, or contact record. Note: The outsource vendor can be used to track reseller or affiliate schemes where an external organisation was responsible for generating the lead. Emails sent out as part of a campaign can be automatically converted to campaign responses if a reply is received from the target (provided that incoming email and tracking are implemented on your CRM system). Campaign responses can also be created as a new activity from the new activity-campaign response menu as responses to a campaign begin to arrive. Here the Received from New Customer details are filled in after the appropriate parent campaign has been selected. 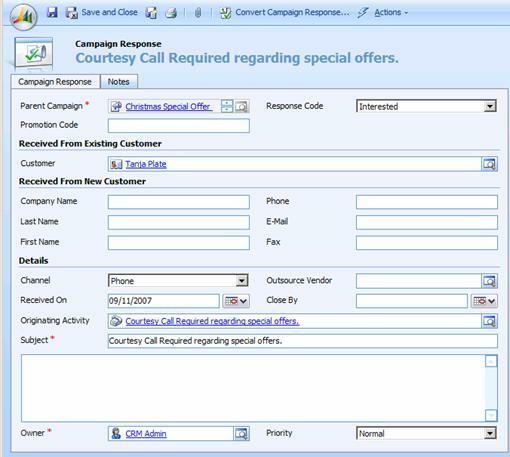 The Convert Campaign Response option is made available once a new campaign response record has been saved and this allows the campaign response to be closed and details converted to a new lead (for new details), or an existing lead to be converted to an account or contact, or for a new quote, order or opportunity to be created for an existing customer. Close the response and change the status to disqualified if the campaign response does not fulfil the campaign requirements.